The journalistic urge to mark anniversaries is suspect: Why would the fifth anniversary of some great event provoke more meaningful analysis than, say, the 4.5th anniversary? And in this particular case, it's not even a great event — just a small ripple in the force that is significant mostly for setting something larger in motion. That said, the 10th anniversary of the climate march in Vermont, which I helped to organize over a Labor Day weekend, means a lot to me. It marked the end of my relatively quiet life as mostly a writer and the start of a hectic stint being mostly an activist. I've thought of it frequently this summer, trying to recapture how the world seemed to me then, and how it seems now. It seems fitting to offer those recollections to the neighbors and friends who marched shoulder to shoulder those five sunny days a decade ago. I'd long been worried about climate change, of course. I wrote The End of Nature, which is generally regarded as the first book for a general audience on the subject, way back in 1989. And for most of the years that followed, I thought we were engaged in an argument about global warming. A writer and an academic, I figured my job was to provide more books, more articles, more talks — and that, with enough data, our leaders would eventually heed the scientific warnings and do something. By 2006, however, that faith was hard to maintain. The U.S. had refused to ratify even the modest Kyoto Protocol. As the scientific predictions began to become reality — among them that the Arctic began to melt in earnest — the Bush/Cheney White House was essentially turned into an arm of the fossil-fuel industry. I started to wise up. The world's scientists had spoken with rare force and unanimity to tell the world that we faced our greatest crisis ever. And yet they were being ignored. We weren't having an argument, it turned out. We were having a fight. Typically, it was a fight about money and power, and we were losing. That loss felt particularly acute to me because I'd recently come back from Bangladesh, which was then suffering its first acute siege from dengue fever. I'd spent enough time in the slums to be bitten by the wrong mosquito myself. But, though I got as sick as I ever wish to get, I was healthy and well-fed going in, and so I survived. It was emotionally overpowering to see people who were dying from the effects of climate change, as the warm, wet world we were creating spread the Aedes aegypti mosquito to new climes. And the people who were dying had done nothing to cause the problem. Virtually no one in Bangladesh had a car. Most of them didn't have a light bulb. I wanted to do something. But there was no real climate movement to join. Environmental groups were working on a variety of issues and climate experts were drawing up elaborate plans, which Washington, D.C., was ignoring. But there was no widespread activism, despite the many pleas for individual responsibility — to stop driving SUVs, to eat more locally. I believed in those things, had done them, written about them and joined in efforts to persuade others. But I no longer believed these efforts were going to change the outcome. We needed some counterforce to the fossil-fuel industry dominating D.C.
Of course, wanting to do something and knowing what to do are entirely different things. I was a writer living in the Vermont woods. I started talking to a small group of other writers in Addison County. What we knew of movement building came from half-remembered vignettes of the civil-rights or anti-Vietnam War movements. What if we went up to Burlington and had a sit-in on the steps of the federal building, demanding action on climate change? We had a meeting. We got excited. Maybe getting arrested would be the spark that would ignite ... something. But someone called the Burlington Police Department to ask what would happen if we carried out our daring plan. The answer was: nothing. Stay there as long as you want. So we decided on a walk instead — a kind of pilgrimage. Walking seemed Vermontish. I sent out an email to people I knew, and they forwarded it to people they knew. Meanwhile, the more practical members of our group figured out what we'd eat and where we'd sleep (farm fields, for the most part). The day came, and we met in the parking lot of the Robert Frost memorial in Ripton — because Frost was our patron saint if anyone was. And because it was five days' walk from Burlington. Organizers always worry, Will anyone come? Enough people did come to make our walk seem respectable, not ridiculous. About a hundred marched that first day down Route 125, through the lovely gorge, and then north on Route 7 to the Middlebury town green. There we gave some low-key speeches and drank lemonade. The crowd ebbed a bit over the next two days as we walked the back roads toward Vergennes, and then the shoulder of the highway through Ferrisburgh to Charlotte. But our group never became embarrassingly small. We survived a near collision with a milk truck in New Haven, and we had ample opportunity for long, long talks. In a world where things move ever more rapidly, feet still plod — there was no need to cut to the chase. It was fun to see old friends and neighbors — and stirring to meet six or seven young people from Middlebury College who came along for the hike. They were already doing strong climate organizing on campus and had some good ideas. After a packed church service in Charlotte, we walked to Shelburne Farms, and the tribe was really gathering. Tents were put up across the fields for the final night. The next morning, when we struck camp and headed off on the last leg into Burlington, we had swelled to an impressive 1,000 or so strong. Walking two or three abreast, we seemed like all the people of Vermont. I remember then-representative Bernie Sanders (I-Vt.) meeting us at the edge of town, excited as much by the organizing as by the cause. 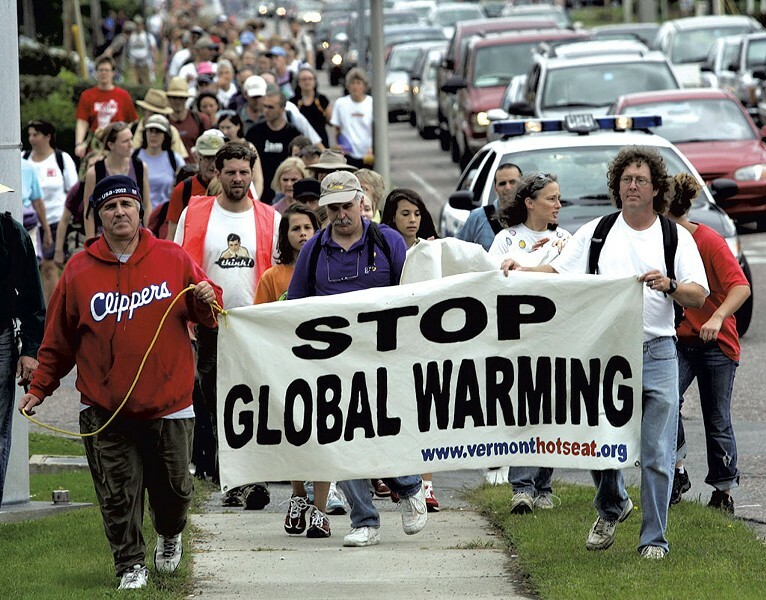 And I remember the rally that followed, as most of 2006's political candidates — including Republicans such as Martha Rainville and Rich Tarrant — signed a pledge to work to cut carbon emissions 80 percent by 2050. In those days, this was a radical ask. I remember, too, reading a story in the paper the next day speculating that those thousand Vermonters might have represented the largest demonstration against climate change in this country to date. That struck me. If we were in a fight with the richest industry on Earth, no wonder we were losing. We had the infrastructure for a movement — scientists, policy makers, economists. We just didn't have the actual movement. But our small band of organizers was encouraged nonetheless. It had occurred to me as we walked that if a thousand people in a single place were what we could muster at the moment, then we should try and do it in a lot of places all at once. Changing your own light bulbs was too small to really matter. Even organizing Vermont was too small to really matter. But organizing every small place on the planet might do the trick. Instead of the standard model — march on Washington in huge numbers, which we did not yet have — we could instead do the equivalent of march on Ferrisburgh in a thousand places at once. With the rise of the internet, the technology suddenly existed to mix all those smaller outpourings together into a bigger river. So those Middlebury students and I tested the model on our nation. The next spring, we managed to coordinate 1,400 simultaneous demonstrations in all 50 states. Each pressed the same demand for 80 percent emissions cut — which then-senators Barack Obama and Hillary Clinton, who were both running for president, immediately endorsed. Then we decided to do the same thing on a global scale and formed the nonprofit 350.org. Our first worldwide day of action, in fall 2009, featured 5,200 rallies over the same weekend in 181 countries. We weren't as alone as I had thought. Plenty of organizing was under way. We didn't "organize" all those protests. It was more like a potluck supper, with everyone bringing what they had. CNN called it "the most widespread day of political action in the planet's history." It was not the biggest, by any means. Most of these rallies were small, and one — in war-decimated Iraq — consisted of a single woman. But they took place underwater on dying coral reefs and atop the highest mountain in Antarctica, in farmers' fields and barrios, in churches and mosques. And, since many participants immediately uploaded pictures to the internet, we were able to show for the first time an outline of an honest-to-God global movement. In the Paris Agreement last year, we finally won some pledges of international action. And in the Democratic platform this spring, thanks to Sanders, a major American political party finally called climate change what it is — a crisis — and pledged to mobilize against it. We haven't won every fight, but the fact that there now is a fight is a big improvement. Is it big enough? July 2016 was the hottest month for which we have records, and scientists suggested that it was probably the hottest month since the start of human civilization. The planet has suffered staggering losses of polar ice; extreme floods and fires seem like the new normal. We've seen the highest wind speeds ever measured and new diseases racing across the globe. Five years ago this week in Vermont, we experienced the destruction of Tropical Storm Irene. In the race with physics, we humans are falling behind. And I have kicked myself plenty of times for not seeing far earlier what needed to be done. The careful reader will notice I've not named any of the good Vermonters who helped launch the climate-change movement — people I consider friends and heroes. There are a couple of reasons for this. One, it's no great delight to be in the spotlight. I wrote earlier this year in the New York Times about the "trackers" hired by a right-wing political-action committee who now follow me in public and videotape my every move. The internet, which has allowed us to organize on a vast scale, also allows an endless hate stream. This week, for instance, alongside the daily nasty flow of email, a major right-wing website called me a "jackbooted thug." In the comments section (never read the comments! ), writers asked if "McKibben's parents [had] any children who lived," stating that I should be "six feet under" and insisting that I was "a waste of good human skin." I wouldn't wish this kind of attention on my worst enemy; it can leave one tired before the day even begins. The second and more important reason for not identifying individuals is that the movement isn't about any one of us. It took me a while to realize this. Pleased with our early success, and hearing people call me a great leader, I think I let my ego flourish. Yes, my constant traveling and talking helped to get a movement up and running. But a few years ago, the limelight began to feel both wrong and counterproductive. We don't have a Dr. Martin Luther King Jr. for the climate movement, and I think we're better off without one. Instead, we have thousands of leaders in thousands of places. That kind of resistance can get in the face of the fossil-fuel industry close to home, and then unite for big actions when needed. The most important leaders of that fight are those who live on the frontlines: people in indigenous communities around the world whose land is disappearing; people in cities blighted by pollution. To amplify those voices, to connect those struggles, to stand behind people who are standing up — that has become my particular passion. Though that work often draws me out of Vermont, I always take some of Vermont with me. Above all, I take the belief that small places matter, and that they can join with other small places to make a difference. Of course, I'm under no illusion that everyone in this state agrees with me about everything. Wind power is a prime example. Former Vermont state senator and ambassador Peter Galbraith spoke in his gubernatorial campaign about the "anguish" of people who were faced with wind turbines. I appreciated that love for place, but I also thought, Anguish is relative. I still want windmills above my house on Middlebury Gap, precisely because I've seen so much anguish in so many quarters, and because I love the natural world, which is threatened by climate change. In any event, I refuse to part with the pleasant illusion that most Vermonters care about the rest of the planet and are willing to take some responsibility for it. And I hope Vermonters are proud that their small state has played an outsize role in the movement to tackle our biggest problem ever. In the end, I will name just one name: Josephine, born in August to one of those Middlebury students who helped to create a movement 10 years ago. We thought the march we began that day at Robert Frost's cabin would last a long weekend. It turns out to be a march that will stretch on for generations. We might get tired, but we march on, happy always for the company. 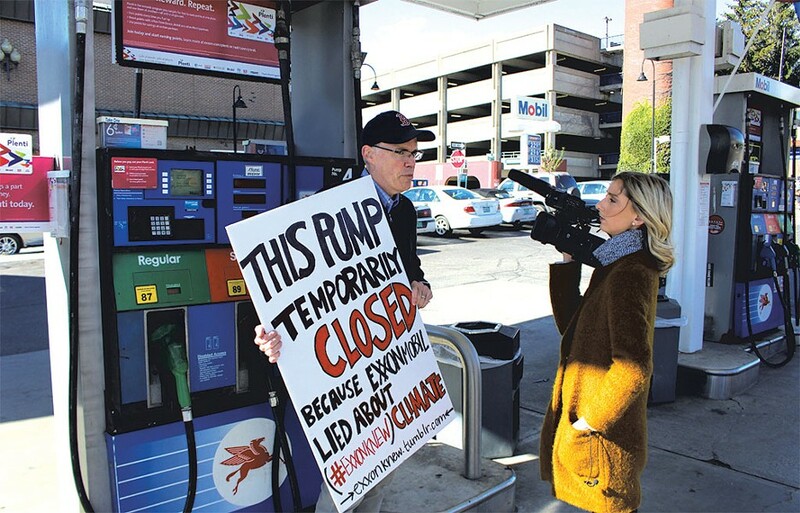 Bill McKibben is the author of many books, the latest of which is Oil and Honey: The Education of an Unlikely Activist, and is a cofounder of 350.org. He is also the Schumann Distinguished Scholar in Environmental Studies at Middlebury College and lives in Ripton.